WASHINGTON (June 18, 2013) -- No later than Jan. 1, 2016, women will be able to apply to all military occupational specialties, and to all Army units, across the total force. 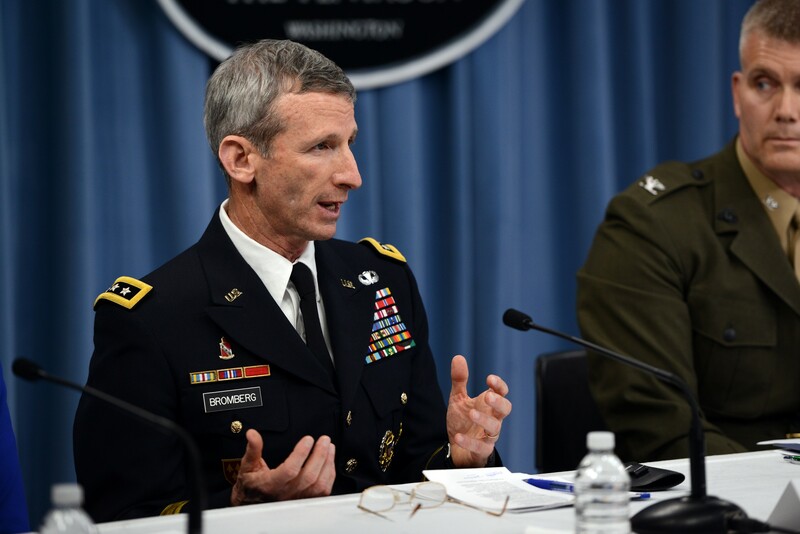 "The Army is very excited about the approval of our implementation plan to move forward," said Maj. Gen. Howard B. Bromberg, Army G-1, during a June 18 multi-service briefing in the Pentagon. 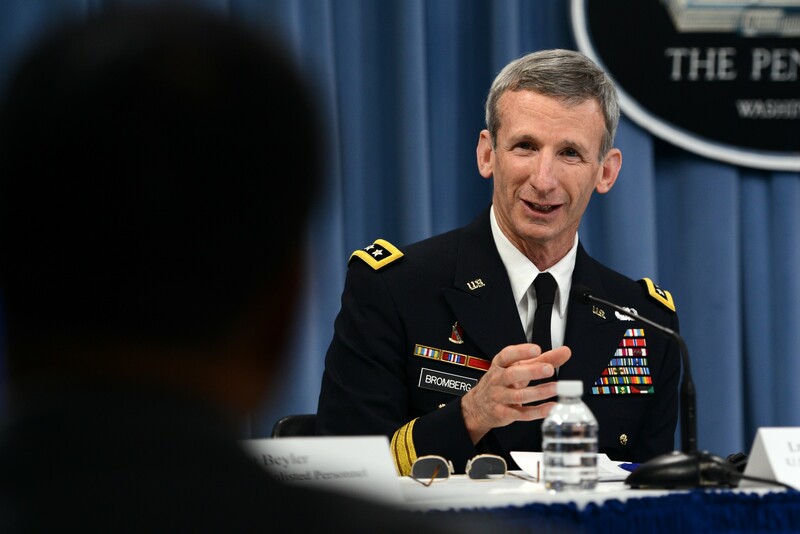 Maj. Gen. Howard B. Bromberg, Army G-1, explained how the Army would implement its plan to integrate women into all areas of military service, during a press conference at the Pentagon, June 18, 2013. Bromberg and representatives from the Marine Corps, Navy, Air Force and Special Operations Command explained how they would implement their specific plans to integrate women into all areas of military service. The Army's plan, like the plans from other services, include first opening closed units to women, and then opening all closed military occupational specialties, or MOSs, to women. Today in the Army, some combat units at battalion level and below are still closed to women. One of the first steps the Army will take is to open those closed units. This step will not involve opening closed MOSs to women, but rather, opening closed units to allow women to serve there in MOSs that are already open to both genders. Already, the Army has made headway in this area, Bromberg said. In 2012, the Army opened 14,000 positions in closed units to female Soldiers with the elimination of the "co-location restriction" through its "Exception to Policy" program. Women were assigned to maneuver battalion headquarters in nine brigade combat teams, known as BCTs, as an exception to the Direct Ground Combat Definition and Assignment Rule. This year, the Army has already signaled its intent to open an additional 6,000 positions within closed units. The Army will accomplish that by opening up an additional eight active-duty BCTs to women -- for a total of 17; nine Army National Guard BCTs; and also positions within special operations aviation. In a plan submitted to the secretary of defense in April, Secretary of the Army John M. McHugh spelled out the details of the Army's way ahead to integrate women into closed units. The Army will continue to open positions in closed units, initially within the headquarters of combat arms units such as infantry, armor and field artillery. The Army will also open headquarters positions to women in reconnaissance, surveillance, targeting and acquisition maneuver battalions. For enlisted Soldiers, about 76 military occupational specialties that are open to both male and female Soldiers are represented within closed units. For officers, there are about 35 officer areas of concentration represented within closed units. And for warrant officers, there are 19 warrant officer military occupational specialties represented in closed units. The Army will begin allowing women to move into positions within previously-closed units in early 2014, first with officers and non-commissioned officers, and then with junior Soldiers. "The further assignment of women to companies and batteries below the level of headquarters will be based on assessments, deployment cycles and specific guidance," reads the implementation plan the Army sent forward to the secretary of defense. "This process will be completed at the end of calendar year 2014 and will provide the framework for opening positions that are currently closed to women." For occupations currently closed to women, the Army is planning on developing gender-neutral standards to ensure all Soldiers have fair access to jobs. However, Bromberg said that it is important for the Army to ensure that the standards meet job requirements. "Whatever that job or that occupational specialty, we have to make sure we have the requirements of that task established -- regardless of male or female," Bromberg said. "The worst thing we could do is change that standard for that position. We have to be absolutely certain that performance can be understood and applied in combat situations. This isn't to set anybody up for failure. This is all about success. We're calling it Soldier of 2020 -- it's not male Soldier or female Soldier." Beginning in July 2014, the Army will first open military occupational specialties within the Army Engineer Branch. New opportunities for women there include combat engineer and combat engineer senior sergeant. Once those occupations open, the Army will assign female engineer officers and any reclassified NCOs to combat engineer companies. This will open up approximately 10,281 positions to women. Beginning in the second quarter of fiscal year 2015, the Army will open previously-closed positions within the Field Artillery Branch. After that, opportunities for women will expand to include cannon crewmembers, field artillery automated tactical data systems, fire support specialists and field artillery senior sergeants. Within the Field Artillery Branch, the change will ultimately open about 15,941 jobs to women. Additionally, the Army will open positions to women with the Armor Branch and the Infantry Branch. Positions there are numerous. Enlisted women will for the first time have the opportunity to serve as cavalry scouts, armor crewmen, infantrymen, and indirect-fire artillery. As a result of this change, about 90,640 positions will open for women in the Army. Within the Armor Branch and the Infantry Branch, the Army will also offer junior officers and junior NCOs the opportunity to transfer branches or reclassify into these occupations as a way to build a cadre of experienced female Soldiers prior to the arrival of Soldiers who are new to the Army.